KATY, TX -- A formula for a championship golf course? Meadowbrook Farms Golf Club found one. Take the Texas Prairie, a sea of tall grass and wildflowers west of Houston, add Lil Prong Creek lined with oaks, sycamores and pecans. Hire Greg Norman to design the course and Landmark National to develop the property. 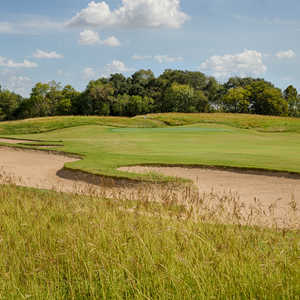 The result is one of Houston's premier upscale, daily-fee golf experiences. "This land was predominately rice fields for years," said Director of Golf Greg Abadie. "You have the creek area with trees and the native prairie and wetlands. The result is an interesting layout than will run you through the trees and along the creek for several holes, then you pop back out in the prairie. I think that's a great design. Another great feature is that you can focus on the hole you are playing and you don't really see parallel golf holes." Landmark National consulted the Lady Bird Johnson Wildflower Center in Austin for ideas on how to conserve the wildflowers and grasses to maintain an authentic Texas Gulf Coast prairie surrounding. Meadowbrook Farms even gives you the opportunity to take home a pack of wildflower seeds they are using to restore the native prairie look. Abadie says Landmark's master plan includes 800 acres of residential development and a second golf course in the future. He says Greg Norman was a frequent visitor and worker during the construction process. "Mr. Norman visited about 10 times during the construction process and he was very hands-on," Abadie said. "He would put on the boots and get into the middle of the work. He pretty much kept the natural topography, you won't find a lot of mound work and reshaping." Some of the features Norman included were stacked-sod bunkers, subtle breaks in the greens and few forced carries. But if you play on a day when the greens are like concrete you need to take note early in the round and take one or two less clubs. Fire at the pin and most likely your Titleist won't hold. Opened in September 1999, the course measures 7,100 from the tips and 5,000 from the forward tees. It has Greg Norman 1 (GN1) Bermuda fairways and Flordwarf greens. It's already being ranked at the top of the list of Gulf Coast must-play upscale courses. Definitely pay attention on this layout. Trouble will find you in the form of native grass and wetlands, deep bunkers, the creek and rock-hard greens. On No. 6, a 160-yard par-3, if you hit it too long you are in the tall grass. On No. 9, a 420-yard par-4, a finger of native grass and wetlands looms just in front of the green and will destroy your score. No. 10 is a beautiful, tight dogleg right and a deadly par-4, 395-yarder. Hit it in the fairway and you might have an easy birdie. Hit it in the woods and you might register a double bogey. Do you like short par-4 holes with lots of trouble? That's No. 15. It's only 340 yards, but bunkers dot the landscape. Hit the target and it's a sand wedge home. The finishing hole is a classic. The tee shot should land short of a drainage canal on this par-5, 545-yarder. Stroke the second shot solidly and your third will get you home in regulation. Meadowbrook Farms will impress you from bag drop "howdy" with its friendly staff, beautiful clubhouse with PGA and Texas memorabilia, large pro shop and reasonably priced restaurant and bar. OK, so there are folks in Houston who won't fall in love with this course. Houston could be one of the most affordable golf destinations in the nation, especially for the locals. But the $70 to $85 green fees have made golfers on a budget in the Gulf Coast area upset. Those golfers should remember it's not 1950 anymore. In California, Meadowbrook Farms would cost you $125. So that's life in the year 2000. Green Fees: Monday to Tuesday, $60. Wednesday to Thursday, $70. Friday to Sunday, $85. 18 holes includes golf cart. Twilight rates: Monday to Thursday, $48. Friday to Sunday, $54. Call for start time of twilight rates. Directions: From downtown Houston on I-10 take the Grand Parkway or Highway 99 exit and go south to Fry Road. Turn right on to Fry Road and follow 1.3 miles to the entrance of Meadowbrook Farms Golf Club. Turn left to the clubhouse. Where to Eat: Texas barbeque and jazz can be experienced at Harlon's Bayou Blues, 530 Texas, downtown Houston in Bayou Place. Telephone 713-230-0111. Shopping and Entertainment: Katy Mills Mall: www.millscorp.com/corpx.html. Your suggestion of "where to eat" if you play Meadowbrook Farms is a litte out of the way. Downtown Houston is about 45 minutes to an hour from Katy. Swampy's Cajun Shack on Grand Parkway and I-10 is less than 10 minutes away and offers great cajun food and live music.